Apple's iPhone release strategy used to be extremely predictable until just a couple of years ago, when the company's first notched model broke the monotony, expanding the family from two to three variants. 2017's iPhone X was followed by two OLED bad boys and a single LCD model in 2018, but Apple even reportedly considered switching to an all-OLED lineup. The same story was rumored to happen this year for a short while, although most reliable insiders and experienced analysts claimed from the get-go this ambitious plan was unlikely to come to fruition earlier than 2020. Digitimes today supports that theory, already adding expected screen sizes for Apple's next iPhone generation after the next one into the gossip mix. Even though this publication's "sources from Taiwan's handset component supply chain" have proven notoriously fickle over the years, sometimes getting their predictions right and sometimes not, we have every reason to trust the forecast for Apple's 2019 iPhone screen technology and diagonal sizes. That's because this is by no means the first time we're hearing the company plans to release an iPhone XR sequel with a 6.1-inch LCD panel and iPhone XS/XS Max OLED follow-ups measuring 5.8 and 6.5 inches respectively. What we absolutely cannot be certain of is Apple's 2020 game plan. 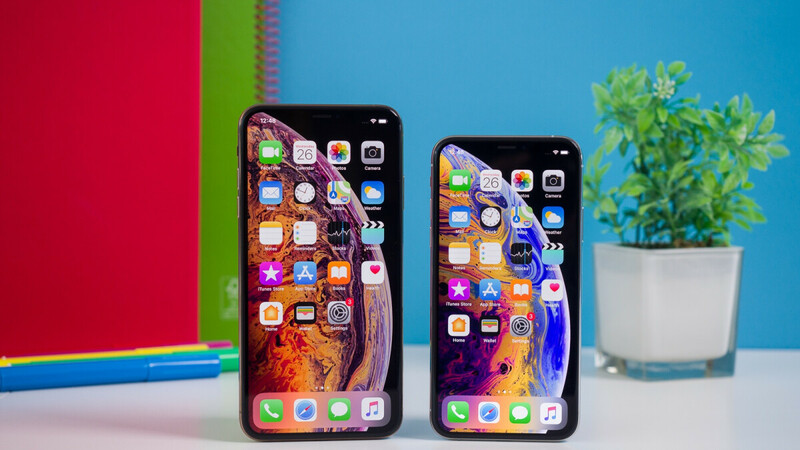 Digitimes points to three OLED models with 5.42, 6.06, and 6.67-inch displays, which means the iPhone XS would go a lot smaller, the XR would essentially stay the same (while leaving the inferior LCD technology behind), and the XS Max would further max out with a screen size trudging towards tablet territory. Does something like that make sense? It's hard to say without knowing more about notches or bezels, and unfortunately, Digitimes isn't making any educated guesses on those two fronts. If you ask us, 2020 should definitely be the year of true "all-screen" handsets, so there's a good chance that extra-large 6.67-incher will be able to squeeze the added real estate into a smaller body than last year's XS Max. Which still doesn't explain why Apple would want to go as low as 5.42 inches for one 2020 OLED iPhone model. Isn't bigger better in the company's view? It's no big secret that Samsung's prosperity is connected to Apple's, but while recently shrinking iPhone sales numbers have caused trouble for both tech giants, their collaboration is unlikely to be perturbed by LG or BOE's small OLED progresses. Apparently, Samsung is looking at taking the lion's share of OLED panel supplies for 2019 and 2020 iPhones after holding a monopoly until not long ago. Rival suppliers LG Display and BOE Technology still need to prove their worth to gain an important piece of the action, which is unlikely to happen anytime soon. That's because Samsung makes undoubtedly the best OLED screens, but also as a result of new technologies in the pipeline expected to reduce costs associated with display production. That's likely to put a big smile on Tim Cook's face, as Apple's CEO is forced to find new ways to increase profit margins with global iPhone shipments on the decline. Speaking of, Apple is currently forecasted to sell "only" between 180 and 190 million iPhone units around the world this year. That sounds like a big number, but it would actually be down from roughly 209 million unit sales in 2018, which also represented a decrease of 2017's 215 million total. Of these 180 to 190 million iPhones, around 80 million units are expected to be sold overall in the first half of 2019, compared to more than 93 million between January and June 2018. That's a pretty worrying trend for both Apple and Samsung. If face id is going to stay. i cant see the notch disappearing anytime soon. So i think the existing form factor will be staying for a long time yet. Smaller flagships is the way to go. If you get rid of the notch and it's really all-screen, you can have reasonable-sized flagships with plenty of screen real-estate. Take away the notch and it would not be all screen, there would still be a 4mm bezel all around. It means the bezels are shrinking by about 3mm if you do the math whilst the form factor stays the same for the 5.8” & 6.45”. Unfortunately the new 5.42 will be the new budget model, probably in the same form factor as the SE. Ah! And I thought Apple is bumping the resolution of the iPhone XR by 20 pixels in 2020. But in all seriousness; the sub 5.5" device should be interesting. I just did a quick check on displaywars.com (Great website!) and interestingly enough; a 5.42" 19.5:9 display will be almost exactly as wide as a 4.7" 16:9 display! And with the bezel less design; I won't be surprised if it turns out to be as big (Or as small?) as the old 4.7" iPhone. It'll surely be interesting... Oh well, G'Day! people have been waiting for apple to release something new such as no notch phone or SE2 but clearly apple failed hard on the fans, so many of them have purchased s10 series. Not sure the hate on LCD screens. A quality LCD screen can look amazing. Apple used IPS LCDs for years, and everyone raved about the quality. But now, all of a sudden, if you use a LCD screen, it's somehow inferior. AMOLEDs look great, but the problem comes with viewing the color white. Colors can look nice and vivid, but iOS and Android are not setup to properly use AMOLED, as neither OS offers a true dark theme. Add JDI to those suppliers.https://www.gsmarena.com/japan_display_rescue_plan_sees_near_1b_investment_go_towards_making_oleds-news-36322.php P.S. If the Xr lcd was so fantastic why change to oled? Maybe it wasn't as fantastic as Leo et al have been claiming? LCD is still overall better than OLED when properly calibrated. Sure, OLED has it's advantages technology wise, but it also has some negative effects on the humans that LCD doesn't. The X is going to reach the 2y barrier and I'm very curious to see how it holds up color wise, because the blue light in its OLED reaches the lifespan limit. Yeah, that's why Apple is going OLED even more. Dude just hush. how's AirPower worki...oh nevermind. Your s**tty qc modem manages to connect or you're just using a land-line? Awww he's copying me. Imitation is the best form of flattery. Those "w" must be from the lag you have with that s**tty QC modem. LMAOOOO! See how easy I made it to find me. I'm gonna have fun with you. It's a notch. Yawn! iPhone has a thin top bezel in the shape of a peninsula, while Note has 2 continents ;). It's a notch. see how I'm controlling you LMAOOOO! You're posting how I want you to. ESPECIALLY considering iOS is a full white OS. LCD>OLED for whites ANY DAY OF THE WEEK! OLED looks horrible for gaming due to black crush and look horrible on pretty much every app due to off white colors. They don't have a clue about 2019 iPhones, now they are talking about 2020 iPhones. They think they know something about the square cameras. What about the rest of the 2019 iohones? Like the display and iOS 13. Stop !! Clickbait everywhere!! Remember the flock relentlessly dogging OLED, and saying how much the iPhone doesn't need em? Now look. That was many years ago, the OLED tech wasn't good enough for Apple. Once the technology improved enough, Apple adopted it. Oh dude puuuuuuuuulease lol. did Tim Cook tell you that? No... Steve Jobs said that. I like the idea of smaller phone. But Apple will gimp it big time with low res screen, less memory and storage. Pretty sure the smallest device will be the "low end" one this time.